Our ever popular double-sided adhesive flush-edge high tack permanent tape is a perfect tissue tape for print finishing work such as folder creation etc, where a higher tack adhesive is required, e.g on laminated card and textiles. 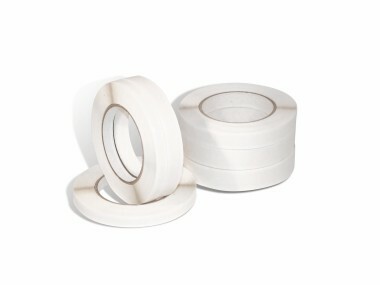 Flushedge double-sided tape has backing which is the same width as the adhesive tape. Available from stock in 6mm, 9mm, 12mm, 25mm and 50mm widths. 50m rolls for hand applicator. Great prices on full carton quantaties. Other widths and lengths available to order e.g 500m rolls for machine application.